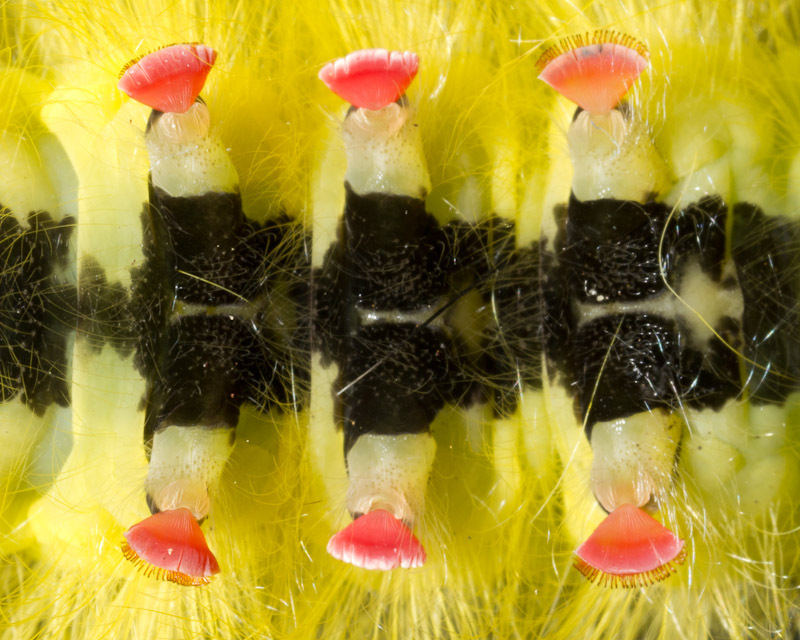 Did you guess that the caterpillar above was the critter featured in Identification Challenge #13? 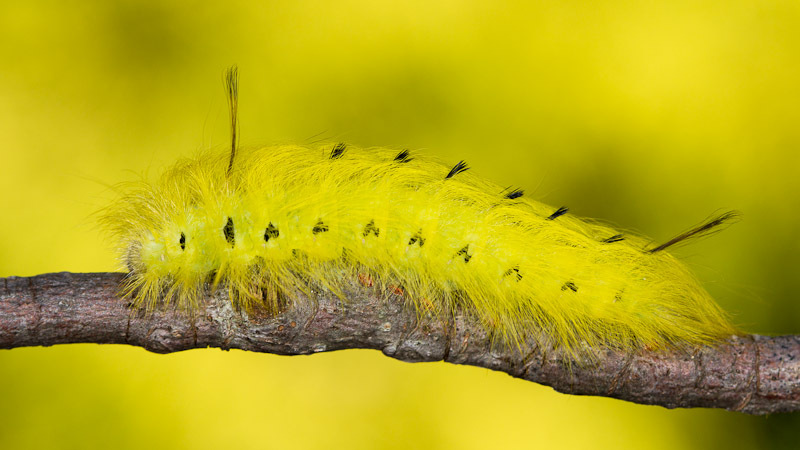 Both commenters for this challenge were on the right track, guessing that it was a caterpillar. Here’s the photo again from the challenge. Here’s an even closer look at the proleg so I can point out a few interesting things. All those little claws on the proleg are called crochets. This particular species, Apatelodes torrefacta, is one of just a handful of species in my area that belong to the family Bobycidae. 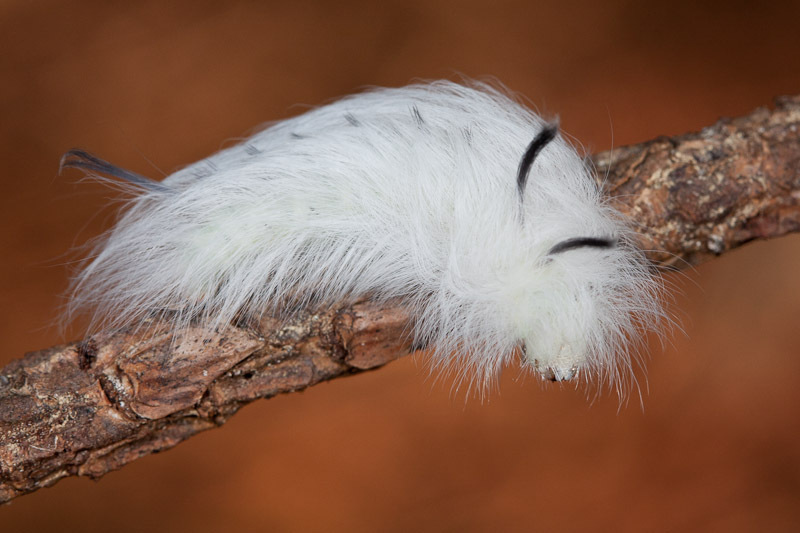 The most famous member of that family is the domesticated silkworm moth. One feature of caterpillars in this family is that they have crochets of two different lengths, as shown above. An identifying characteristic of Apatelodes torrefacta is its vivid red legs. 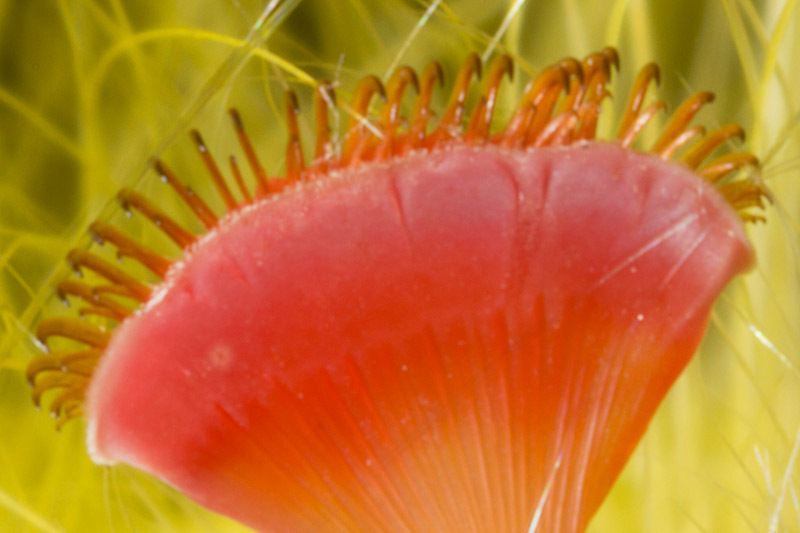 They contrast with the overall color, which varies from white to yellow. Here’s some more interesting compositions of those distinctive feet from the individual featured in this challenge. In the next shot, note how the middle pair of prolegs appear to be missing crochets. 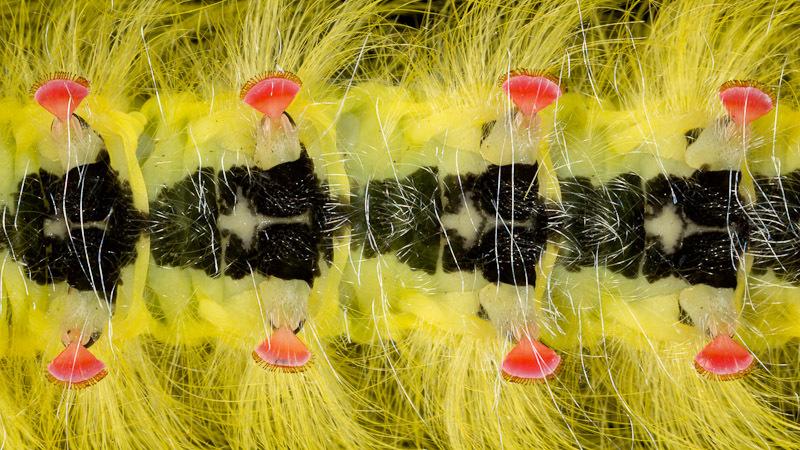 In fact, this shot was taken as the caterpillar was moving forward. The crochets are hidden behind the prolegs, not retracted but bent backwards out of view. The front top proleg is just starting to lift. 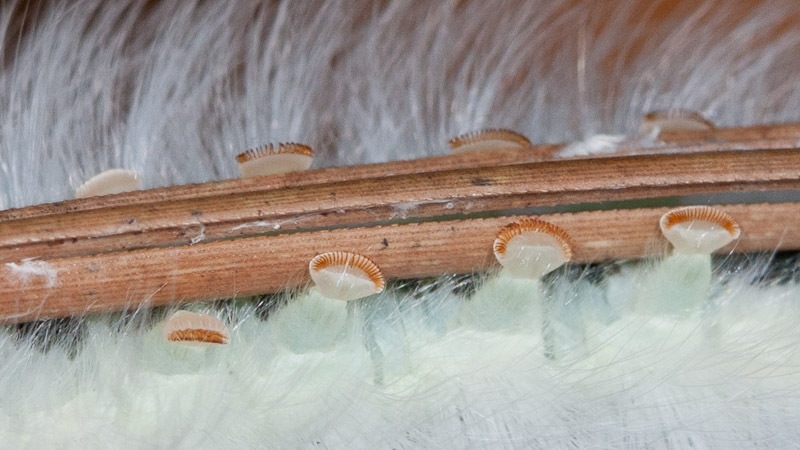 Here’s all the midabdominal prolegs. Compare the prolegs above with the true legs shown below. It’s easy to see how the prolegs would have significantly more grasping power with all those extra claws. 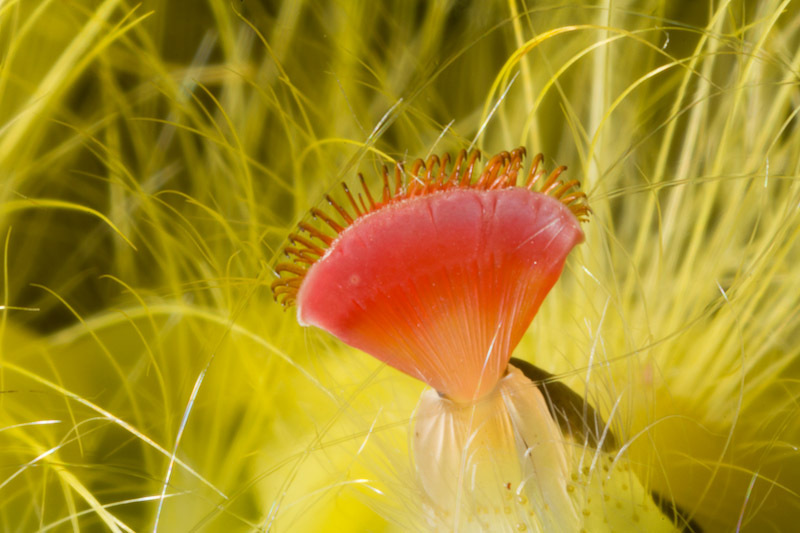 If you’re familiar with this species, you might have noticed that it’s missing one of its front lashes (the longer sets of hairs). This individual was readily losing hairs as I photographed it. Based on size and time of year, this individual was almost certainly prepupal. At that stage, they easily shed their hairs and are apt to lose their lashes as well. If you look carefully, you can just see the red prolegs grasping the twig. Here’s a few notes on the photos. 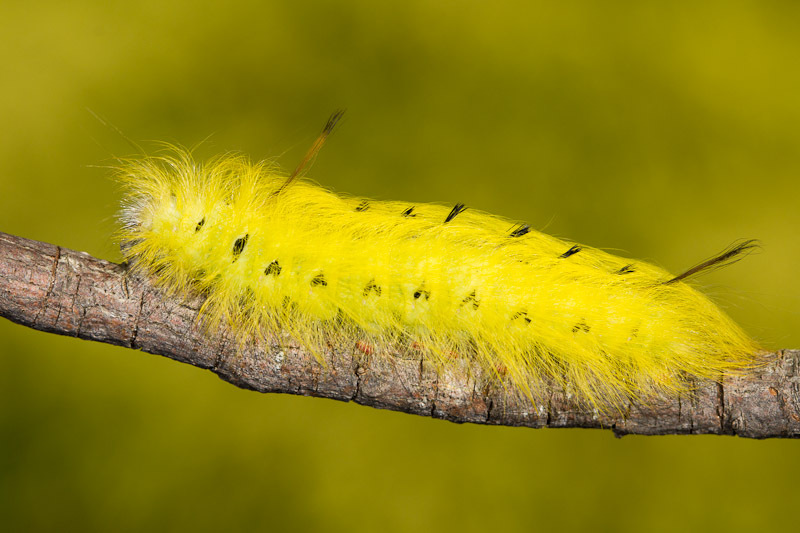 The two images showing the full caterpillar were taken in front of some attractive foliage in my yard. The rest were taken through glass, allowing me to capture the underside. I wasn’t sure the caterpillar would be able to grip the glass if I flipped it over. To my surprise, it held fast once I did. It immediately started laying down silk on the glass though. I thought at first it might be spinning a cocoon, but in fact it was just laying down a silk track to walk on. At the end of the photo session, there was a small trail of silk on the glass where it had slowly made its way forward. 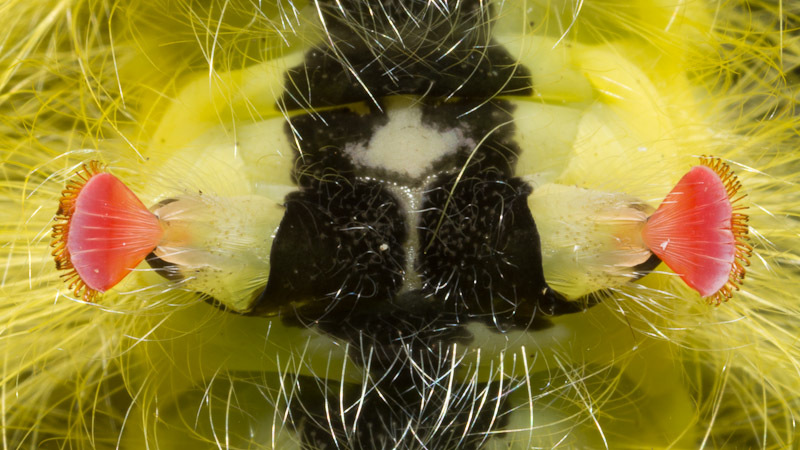 You can see some of those silk strands on the glass in the photo above showing all the midabdominal prolegs as well as the one after that showing the true legs. 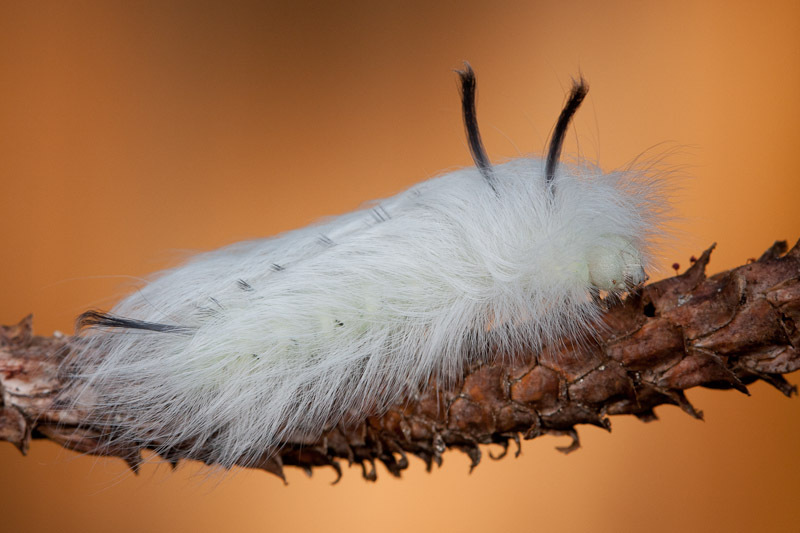 Here’s a a smaller white caterpillar I found in my yard a few years ago. I photographed this one against sun-dappled pine straw. This one has all its lashes. The red prolegs must develop in later instars, because this one still has white prolegs. I’ve certainly seen adults of this species, but I couldn’t find an image of one among my photos. If you’re curious, there’s plenty on BugGuide. This really is a nice photo series. 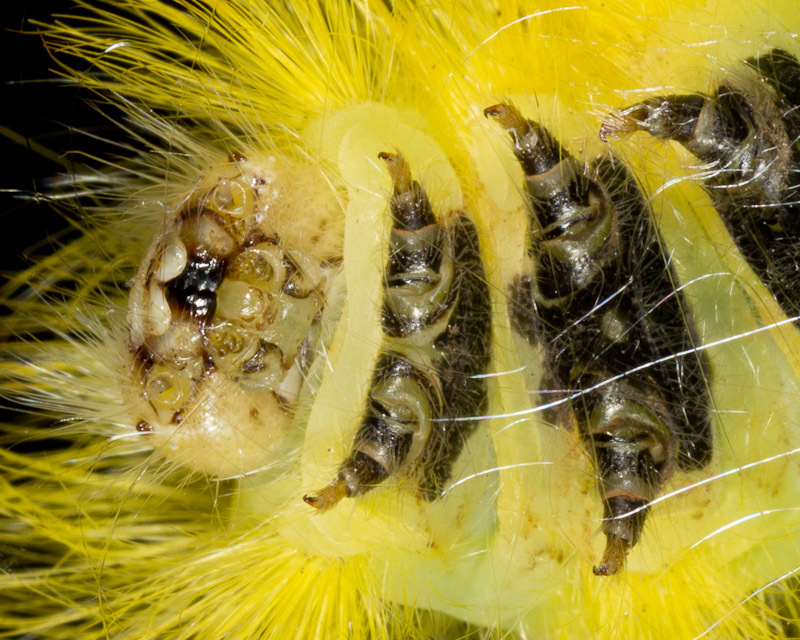 Good idea to put the caterpillar on glass to photograph the prolegs. Thanks, Ted. I’ve been doing slug caterpillars under glass for awhile. This is the first time I tried one of these bigger ones though. You have AWESOME photos. I posted one for people in my area with a link to your site to recognize that you took it. Not only could I identify the cat, but your photos are amazing. Thanks for the compliment, and I’m glad you’re enjoying the blog.